Whether by compromised data, cracked passwords, or phishing, real estate is a target for cyber criminals. 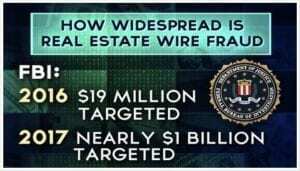 More and more over the last few years, homebuyers and sellers-and the practitioners who serve them-are reporting theft via wire fraud. Typically criminals gain access to emails, learn of a pending transaction, and then message phony wiring instructions to victims. Bogus DocuSign emails, emails with illegitimate referrals, and ransomware attacks are also on the rise. Being a victim of wire fraud can be devastating – as your funds are almost always irretrievable once sent. And aside from making off with money, criminals can gain personally identifiable information, through any of a combination of schemes. This can be used for other crimes. Often scammers get initial information on an individual from social media sites – birth dates and photos for example. The first step in protecting yourself from fraud and especially wire fraud, is being aware that you may be a target. By educating yourself on the danger, you’re much more likely to identify suspicious activities and unorthodox changes to procedure that are utilized by hackers. Be sure that you clearly understand the wiring instructions for your transaction, and ensure that you’re getting that information from a verified source – the attorneys secure portal and if needed, confirm anything you have a question about with a staff member you know for a fact is with the firm. All closing attorneys we use in East Cobb and North Fulton will be using a secured portal to send you instructions about making wire transfers to their designated escrow account – they will never do this by phone or email. We as brokers and agents will not give you wire instructions. Most closing firms will also have their standard procedures posted on their website. As an extra step, make a phone call to a number that’s listed on the closing attorneys’ website to speak with a real person to verify the information you receive in the secure portal. Take common sense precautions with cell phones and laptops – don’t open links to access secure portals or your bank while using unsecured public Wi-Fi at restaurants, hotels, etc. Trust your gut – if something seems wrong or fishy, it probably is. If you are sent a message requesting a partial payment, notifying you of a change in the deadline for your transfer, or detailing a new procedure for your wire transfer, don’t do anything without talking to your real estate agent. Your agent likely knows the law firm personnel well and can reach them regarding any odd or last minute changes. Last minutes changes in general – and especially contacts to you regarding wire transfers that are made via phone call, text, fax, signing software like DocuSign, or email are big red flags. This entry was posted in Blog and tagged Fraud in Real Estate, Wire Fraud in Real Estate by admin. Bookmark the permalink.